PREFER TO BE SOLD AS A PAIR. 2 New 2017 Yamaha 300hp 25" shaft motors still in factory packaging. Manufacture dates of 03/17 and 07/17. Meant to be sold as a pair as one is counter rotating (LF300XCA). Will sell the LF300XCA individually. Leading Time-to-Plane: Their class-leading, 4.2L big-bore design means they have the best time-to-plane in their class. When cruising at 4000 RPM, the F300’s speed is up to 19% faster than other 300hp competitors. Class-Leading Displacement: This next generation of V6 Offshore outboards features the first-ever marine application of plasma-fused sleeveless cylinders. This allowed engineers to increase the displacement to a class-leading 4.2 liters, without enlarging the outer diameter of the cylinder, keeping the motor light. The result is an outboard that is not only the lightest in its class, but that also has the largest displacement. No wonder it’s 19% faster than many other 300hp competitors. Groundbreaking Fuel Economy: These V6s feature up to 17% better long-range fuel economy at 3500 RPM than comparable 300hp four strokes, thanks in part to a single, electronically controlled throttle valve, precision multi-point fuel injection and micro-textured cylinder walls. Light Weight / Industry-First Technology: Through incredible innovations like plasma-fused sleeveless cylinders, Yamaha engineers have managed to shave every possible ounce from these outboards, without sacrificing a shred of durability or reliability. 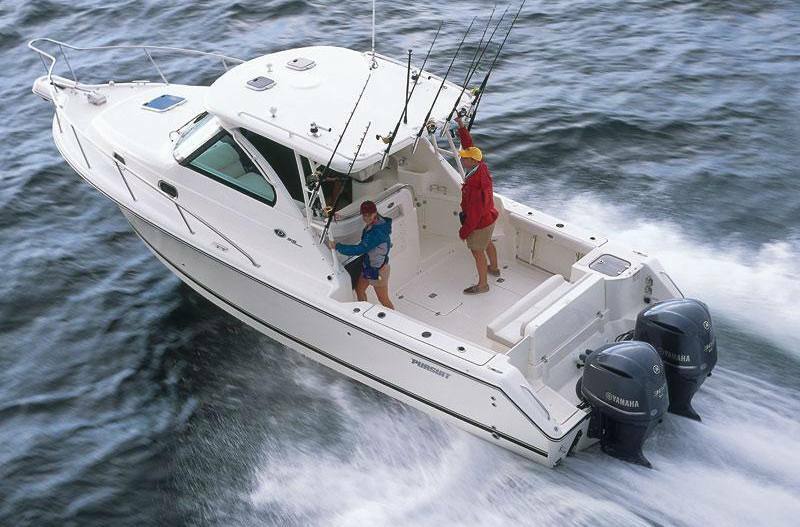 As a result, they’re up to 73 pounds lighter than other V6 outboards in their class. Intuitive Control: Available with the Helm Master® fully integrated boat control system in twin-, triple and quad-outboard configurations. 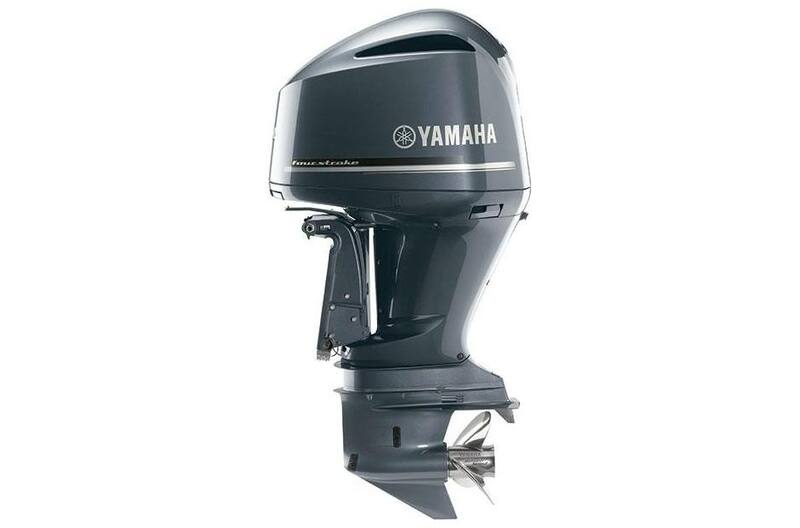 4.2 Liter Big-Bore Displacement: By using a highly advanced thermally applied plasma fusion process on the cylinder walls, Yamaha’s new line of V6 Offshore outboards have no conventional steel cylinder sleeves, yet the cylinder walls are 60% harder than steel. That means larger cylinder bores for increased displacement, resulting in more power and torque, without increasing outer cylinder dimensions. It also results in dramatically lighter weight and better cooling, and “Micro-textured” cylinder walls that help decrease friction loss, and further increase performance and enhance reliability. Lightest Weight in Class: From the top of the cowling to the tip of the propeller shaft, every ounce of weight-savings has been realized for maximum performance without sacrificing durability. There’s even a new advanced polymer composite lower engine pan that lowers weight and increases corrosion resistance. Throttle Response and Acceleration: Yamaha’s Variable Camshaft Timing system advances and retards the angle of the intake camshaft to dramatically increase power and throttle response in the low- and mid-rpm ranges. This feature helps Yamaha’s new 4.2 liter big-bore V6 Offshore Outboard to deliver awesome hole shot and mid-range acceleration you have to feel to believe. Best-in-Class Fuel Efficiency: Yamaha’s 300hp V6 Offshore outboard has up to 17% better long-range fuel economy at 3500 rpm than other 300hp 4 stroke outboards. All air entering the engine block of each Yamaha V6 Offshore outboard is routed through a single 75mm electronically controlled throttle valve. Working in concert with the Precision Multi-Point Fuel Injection System, together they help ensure the precise amount of air and fuel necessary for optimum power and fuel efficiency. The reduction in friction from the Micro-Textured Cylinder Walls further adds to this outboard’s amazing fuel economy. Best-in-Class Charging Power: With 70 amps of total alternator output, Yamaha’s new V6 Offshore outboards have over 29% higher total alternator power than other V6 four stroke outboards. That kind of charging power is vital to help operate today’s wide array of on-board electronic devices. More Information / Security: Featuring a new 5” high-contrast, multi-engine, LCD display; new Command Link Plus® Digital Electronic Controls; new key switches and start/stop panels; and new Command Link Plus accessories, this system offers more convenience, flexibility, and information than ever before. There’s even the optional new Y-COP™ Immobilizer system, which allows the operator to disable the outboard’s ignition system using a battery-operated key fob during periods of non-use, thus helping to deter theft. Protection from the Elements: All Yamaha V6 Offshore outboards feature a proven cowling drain system, to easily and efficiently drain away any water that enters the cowling during normal engine operation. Incoming air is routed through a labyrinth of passages that trap and drain water before it enters the engine’s intake, for maximum reliability. Reliability and Efficiency: 4.2 liters of class-leading displacement teams with individual intake and exhaust camshafts to provide more precise valve timing control with fewer moving parts than conventional rocker arm systems for increased reliability. This superior design also allows for use of 4 valves per cylinder which exchange intake and exhaust gases more efficiently for responsive power and increased fuel economy. Shaft Length: X = 25 in. Degree of Tilt: 67 deg. Degree of Trim: -3 deg. through +16 deg.